What ingredients could I possibly use that would remind me of this fun occasion? It has to pumpkins! My son will also be happy as he can do the usual carving of a spooky face at the same time – waste not, want not! And to me, nothing says autumn like pumpkins do. So as Fright Night is drawing in and guys and ghouls will be gathering for tricks and treats, why not hand your friends and family a Pumpkin and Cinnamon cupcake – you can also try to convince them they are indulging in a healthy snack too. 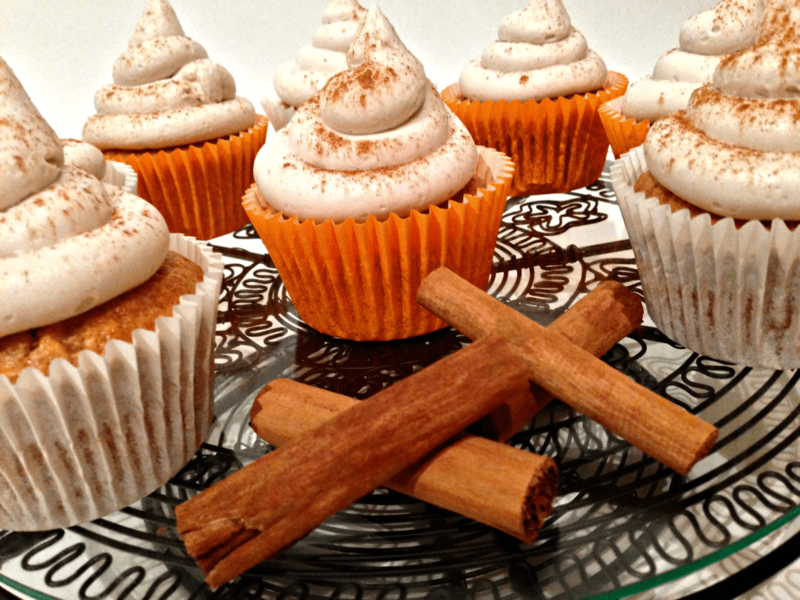 With these Pumpkin and Cinnamon Cupcakes, you will have naturally bright orange cupcakes that are infused with the real flavour and goodness of the pumpkin. Made with such distinctive ingredients the cupcakes are moist inside, bursting with flavour and are complemented with a kick of cinnamon. The cream cheese buttercream just melts in your mouth with its silky smooth taste. Pre-heat your oven to 155 degrees C and line your cupcake tray with your cases. Cube your pumpkin, boil and when soft mash up with a fork. It is important to do this step first so your pumpkin has time to cool. I also add some of the mushy insides of the pumpkin as the flavour is really strong. Don’t worry if you get any seeds in either as you can pick these out when mashing. Add all your dry ingredients in one large bowl. Add your wet ingredients in a separate smaller bowl, including your grated fresh ginger. Combine all ingredients together folding in gently. Add your pureed pumpkin and then spoon into your cases filling about 3/4 of the way. I like to keep my cream cheese buttercream quite simple. I don’t feel it needs much else, but for a little something extra you could try sprinkling some cinnamon, ginger or a squeeze of lemon juice. These cupcakes can be eaten as a little treat (my preference) or they can be the perfect dessert to any lunch or evening dinner. I do hope that you have enjoyed reading and that you give my recipe a try.